LinkedIn is excited to offer companies, including our Career Page customers, a powerful new way to maintain relationships with passive talent. 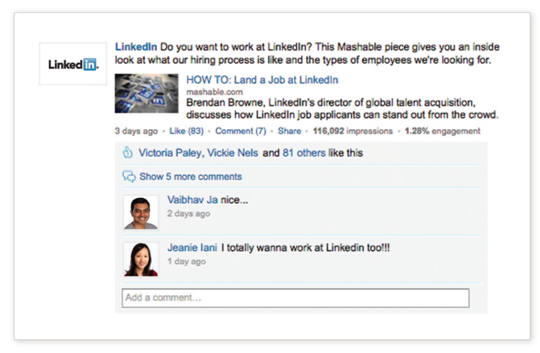 Company Status Updates is a new feature that gives companies a direct line of communication with their LinkedIn followers. It has always been difficult to stay relevant to passive candidates. These professionals are interested in great career opportunities, but rarely visit careers websites or reach out proactively to look for a job. Engaging these types of candidates is a multi-touch process that takes place over time. Company Status Updates now offer an easy way of maintaining the conversation with a group of people who have already expressed interest in your company. Your updates come directly from your company and reach all of your followers in their network update streams. You can share exciting job opportunities, articles about your company and industry, or links to employment branding assets like your LinkedIn Career Page. Status updates also generate viral buzz beyond your group of followers as people share, like and comment on them. Those actions help your messages reach your followers’ connections, their connections and so on. Finally, you can see exactly how far your messages are reaching with analytics on how many people are viewing and engaging with your updates. Open the dialogue with your followers and start making updates today. For more tips on how to effectively message to your followers, see our tip sheet here. For more information on creating a LinkedIn Career Page, click here.